Freddie's got his work cut-out today! If you need sleepers, you should talk to us first! 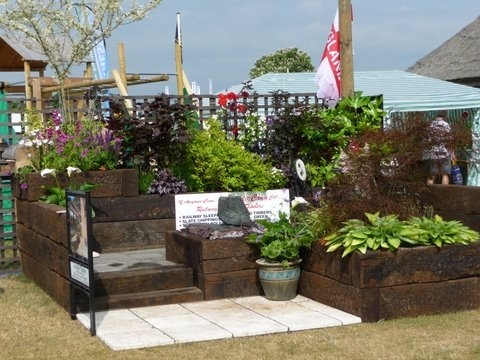 Based in East Anglia, we have been supplying sleepers to happy customers for the past 30 years. 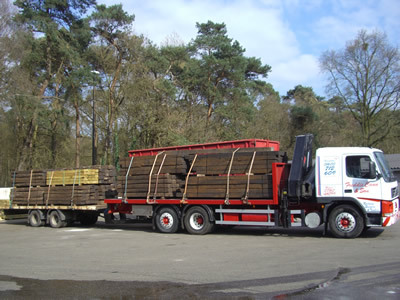 We have been importing only top quality Hardwood sleepers for 10 years and pride ourselves on our good service and quality with between 25,000 and 30,000 sleepers supplied annually to the Eastern region and stockist's nationwide. Buy direct and save a packet! We are based to the north of Norwich just off the A140 approx. 4 miles from Norwich International Airport. We always carry stocks of between 5000 and 7000 sleepers of differing grades from brand new untreated Oak to creosoted Relay sleepers down to landscape grade. We also supply Hardwood crossing timbers up to 4.6m in length with the same dimensions as sleepers. Other products in stock include Telegraph poles 24'-30' in length and Slate chipping's in three different colours: Plum, Green or Blue supplied in one tonne bags. Sleepers are typically 8' 6" long, 10" wide and 6" thick or 2.6m by 25cm by 15cm. Sleepers can be cut to length at a cost of £4 per cut, this charge is due to the chainsaw wear. Sleepers can either be collected from our yard by appointment or delivered to your premises. Delivery cost depends on the quantity ordered and distance from our yard, delivery times are arranged for your convenience and typically vary from 2 days to a week. We now deliver railway sleepers in Ipswich. Please note VAT is charged at 20% on all items. Yard Address: Freddie Cann Ltd, Shortthorn Rd. Stratton Strawless Norwich NR10 5NU.